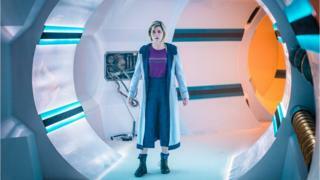 Doctor Who actress Jodie Whittaker has revealed she was told to get a line in her forehead filled and her top lip waxed when she began acting.Whittaker is the first woman to take on the title role in the BBC's long-running science fiction series.She made the comments to David Tennant, who played the 10th Doctor, on his new podcast.Whittaker told Tennant she was glad she did not give in to early pressure to change her appearance. The actress, who also starred with Tennant in ITV's Broadchurch, said of her forehead: "I wouldn't change it for the world and there are a lot of episodes where you're squinting and I think if I didn't have that frown line you wouldn't know it was sunny." Whittaker continued: "I got asked to get my 'tache waxed and I didn't know I had one. It was translated to me in Hungarian, it was so funny". "She explained how she dealt with the request: "I said I would probably be allergic to the wax. I said 'Sorry you will just have to colour it in'." Tennant said he used the same accent he had spoken with for the 2005 TV series Casanova, which was also written by his Doctor Who showrunner Russell T Davies.He said: "Well, I'd just done Casanova with Russell and that's how I'd spoken in Casanova. And that's how they wanted it to be".